Rarely is there highly compelling video of an airplane crash landing in which no one dies and no one gets hurt. Yet—amazingly—that’s exactly what happens here. A Boeing 767 LOT Airlines flight took off on a seemingly routine flight from New York City with with 230 passengers aboard. 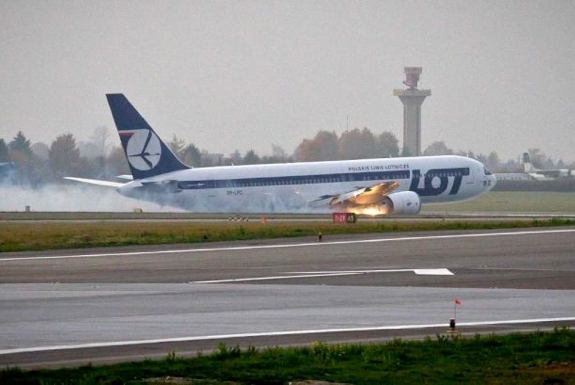 As the plane began it’s descend into Warsaw’s Chopin International Airport, pilot noticed that the landing wheels weren’t lowering. After an hour circling above the Polish capital it became clear that the issue couldn’t be fixed while the plane was in the air. So the decision was made to land sans wheels. Can you imagine being on board and hearing THAT announcement over the loudspeaker? The plane dumped all the extra fuel it could while airport officials cleared the airport and coated in the runway with a special fire retardant. Then the plane came in for a landing. An absolutely perfect landing, thankfully. The first phone call the plane’s captain, Tadeusz Wrona, received was from the president of Poland offering his congratulations. Spot Cool Stuff is mighty impressed as well.